Published from my 'Worship Today' blog. 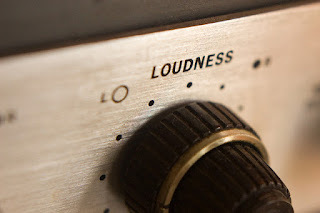 The common progression in a worship service often goes from loud to louder and then even louder. Worship leaders often believe that, that is the way to go. To give their very best and to worship from the heart requires, so they think, a corresponding increase in the decibels. The result of this myth is not better worship but has led to many half deaf musicians and yes, half deaf congregations too. There are certainly times to be loud as we celebrate the bigness and greatness of God. But to do that every week in every service and every moment of the service makes it 'boring' and even irritating at times. There is no variety in it. Good musicians understand tension in a song. They know the correlation of the loud and soft side to music. More than that, it is the failure to understand that we can experience God in quiet moments. God wants to speak in quiet moments. His voice can be heard if we do not drown it out by the overwhelming loud music and our self interest of feeding our own emotions. Don't fall in love with your voice or the sound of the band. We do need good sound. I am all for it. But still the primary goal is more than the sound. It is God. Fall in love with God's voice and let Him speak. It is after all, His meeting. Quiet moments can be very powerful and life changing. Moses, alone in the back side of the desert, was changed when He heard God speak from the burning bush. A crushed Elijah trembled when he heard the still small voice of God. The preceding strong wind, earthquake and fire did not make a dent on him. Jonah repented in the belly of the fish. Joshua and Gideon rose up with courage and great confidence from their personal God encounters. Jeremiah shook off the discouragement when he was thrown into a dry and lonely well; cause there in that dark pit God lit the fire of His word to burn in the prophets bones. John receive the revelations in exile on Patmos. So the next time you lead or play for a worship service, don't just go loud and louder. Take a detour to the quiet side. You may just find God waiting for you and the congregation. Maybe I am getting older and growing more mellow to prefer the quiet. Yet again, I think I am actually understanding more about the beauty of dynamics in worship and appreciating the movement of God when He speaks and we actually listen to His matchless voice. Hab.2:20 But the Lord is in his holy temple; let all the earth be silent before him. It all starts with a vision. A vision of better things to come. There are four verbs in Isa.54:2 Enlarge, Stretch, Lengthen, Strengthen. Each of these action words require effort, determination and sacrifice. One's willingness to do extra work begins with a captivating vision. It becomes worthwhile when we catch a grand vision of what things can be. We will be willing to go the second mile, carry the excess load, push through unpenetrable barriers for a worthy and glorious cause. When Isaiah saw the vision, the nation of Israel was in tatters. Dust, ruins, darkness and despair were in charge. Many Jews were deported as slaves to faraway lands. The misery seem to last without end and the glimpse of relieve only came when they were told that it would endure for 70 years. In those dire times, Isaiah saw a vision that encompasses 3 areas. A vision so grand and majestic that invigorated the people of God to prepare for better days soon to come. 1. Isaiah saw a vision of multiplication. "Isa.54:1 The barren woman will sing because more will be her children than the woman who has a husband. Isa.54:3 ...you will spread to the right and to the left." The population was almost decimated except for a small group of survivors. God told them they will multiply again. There will be so many that they will grow and occupy the length and breadth of the land. 2. Isaiah saw a vision of battles won. "Isa.54:3 your descendants will dispossess nations. Isa.54:15b ..whoever attacks you will surrender to you. Isa.54:17 No weapon forged against you will prevail.." They will no longer be victims but they will be victors. They will move from slave-hood to son-hood. They will no longer run away like chickens but rise up as champions. 3. Isaiah saw a vision of restoration from brokenness. Isa.54:11,12 "O afflicted city lashed by storms and not comforted, I will rebuild you with stones of turquoise, your foundations of sapphire....rubies..sparkling jewels...precious stones." It goes beyond just rebuilding, it moves into beautifying and significant value increase due to the materials used. It means that God will make things far far better than before. God's will is to increase the church and increase the ministry's impact in the world. Many will find joy and peace in Jesus. God wants to increase you, increase your influence, increase your standing. 2016 is not a year without battles, but a year of battles won. You will experience many victories. Shattered dreams will be resurrected and perfected. It is going to be better than before. Far far better. Enlarge the vision. It's time to believe. Isaiah 54:2-3 (NIV) “Enlarge the place of your tent, stretch your tent curtains wide, do not hold back; lengthen your cords, strengthen your stakes.For you will spread out to the right and to the left; your descendants will dispossess nations and settle in their desolate cities. The Spirit of God helps us to overcome 4 weaknesses of our prayers. What are these 4 weaknesses? 1. We do not know what we ought to pray for. We often pray selfish prayers. We have our own prayer list but it can be far from the list that God has. Our list is shallow and narrow. It is often self focused, self serving and self directed. The Spirit's list is totally different. The list is written by God himself. The things that are important to Him. It is about the Kingdom, it has eternal impact whereas our list is about ourselves, our families and even our church only. It is alright to pray for personal items, but it is not alright to stay only at that level. 2. We sometimes do not feel the urgency of things. We miss his timing. We miss what He wants to get done at a certain time. Right timing is important. Queen Esther was made by Mordecai to understand that intervention to save the Jews requires immediate action. Praying and acting after the specific dateline is over will be useless. The church was in much prayer for Peter when he was thrown into jail. They were not occupied in praying for the distribution of food or some other church programs. The Spirit has the perfect timing. He might move you to wake up and pray in the middle of the night. A burden for prayer may suddenly land on you while you are driving or working behind your desk or cooking. When this happens, obey the Spirit of God. He is strongly nudging you to get into His presence and uphold the person or situation in prayer immediately. 3. The Spirit guides us pray in specific details to fulfill the plans of God. We may pray for the right concerns at the right time but still pray for the wrong outcomes. This is because our ways are not His ways and His thoughts are not our thoughts. We may pray for deliverance, but the Lord may want us to go through the fiery ordeal and teach us a valuable lesson. We may pray for provision but the Lord may want us to give up that pursuit. We may pray for success, but the Lord may delay it because He knows what it can do to you if you have the success now. The Spirit of God knows the mind of God and helps us to pray specifically and accurately the will of God. When we pray in the heavenly language, the Spirit who gave us that utterance will guide our prayers to fulfil the exact will of God. 4. We often lack passion in our prayers. Passion speaks of what we feel and also how much we want what we are asking for. Lifeless, cold and repeated prayers will not be effective. The Holy Spirit expresses his burdens in us and causes us to respond with deep groanings. The Spirit wrenches our hearts and prayers beyond words are released. It can sometimes sound like a pregnant lady going through labor. In the same way, the Spirit prays through us so intensely as He uses our prayers to birth things in the spiritual. Great power is unleashed to invade the spiritual realm. Be transformed in your prayer life with the heavenly language of the Spirit. Let the Spirit fill you and lead you in your prayers. A transformed prayer life, transforms the pray-er and the situations prayed for. In the same way, the Spirit helps us in our weakness. We do not know what we ought to pray for, but the Spirit* himself intercedes for us* with groans that words cannot express. Prayer brings us to intimacy with God. Rapturous joy fills our hearts, when we are in communion with the one who loves us the most. Heaven opens up and his glory floods our very being. Yet there are times, a believer struggles to pray. The stresses in one's life, preoccupies the mind and burdens the soul. The flesh dominates the consciousness and our spirit is weak and dull to His presence. Rom.8:26 In the same way, the Spirit helps us in our weakness. At such times, we need to humbly come to Him and confess that we are far from Him, that we are struggling to focus and that we don't feel like praying at all. Confessing our weakness, we call on Him to help us. We pray to ask for help to pray. Then start to pray in the heavenly language. The heavenly language is the means the Spirit comes to pray for us. He comes alongside and brings the strength we need. He awakens and stirs our spirit. He silences the flesh and helps our mind to be collected in focus on God. He ushers us into the presence of the Majesty. He provides the words of the heavenly language. The Spirit of God does not chide us in our sputtering feeble prayers. He does not mock us when we ask for help in such a seemingly elementary spiritual discipline. The fact is, we are actually incapable of any spiritual progress apart from Him. We are not as great as we think we are. And He knows it. He knows us better than we know ourselves. Therefore, God's Spirit delights in us asking Him to help. He dashes to our side when we whisper his name. He hears our faintest and frail utterance. The Spirit comes to us. The Almighty comes to us when we call on Him. With all that God has to attend to - the salvation of the world,the healing of the sick, the defeat of injustice, the battle against evil...etc He still comes and comes quickly to the least of His children calling Him to assist in their prayers. To help us in our weakness to pray. Have you ever run out of words to praise and to pray? You do not know how to pray for a particular need. You are not certain of what the will of God is, and your prayer is reflective of that uncertainty. You struggle to connect with God and His presence seems so distant. You are weary and dry in your walk with God. You lack power in carrying out the work of the ministry. You need the heavenly language. But what is this heavenly language? The heavenly language can also be the language/s of angels. Whether angels speak only one language or different angelic languages, I do not know. Paul does state in the famous love chapter of 1Cor.13:1 that a believer can speak in tongues of men and of angels. (tongues of...angels) I will assume that there is more than one angelic language. Angelic languages is of a different kind from every known human languages. Yet, through the Holy Spirit, we can access and have the ability to speak in angelic languages. This is a priceless gift that no man, nation or linguist can ever teach a believer. Tongues are a means to aid the believer to praise and worship God in a different dimension. The Holy Spirit enables the believer to break through the limitations of our minds and our vocabulary and releases our inner self to freely glorify God. A believer filled with the Spirit is not inhibited by what he knows and the words he knows. His spirit is set free and enters into a new level in praising the matchless God. A new found freedom and deep inner connection with God is experienced. In your personal and corporate worship time, release the language of the Holy Spirit and let your spirit soar free and boundless to declare the greatness of God. Enter into the private chambers of the Lord and let your praise gush forth from your deepest of the deep within you. @ArisSiew If you want to go far in life, look up to Jesus daily and look within your heart regularly. If fear is at the driver's seat of your life, remove him right away. Fear will always crash you. Any contamination of the heart is a weight that will slow you down. Get rid of them and the excuses they give for staying. @ArisSiew Do what is right with no fear of people of might. @ArisSiew After any crash, rise up, wise up, step up and move up. @ArisSiew A wise leader knows when to give away power and when to give away his position. @ArisSiew Leaders destroy lies, or lies will destroy a leader. @ArisSiew: A person is not fit to lead when he puts his pleasure ahead of the pain of his people. @ArisSiew: A leader run towards crisis, not from it. He looks for solutions, not dig for skeletons. @ArisSiew: True religion sacrifices oneself so that others may live. They are life givers not life takers! @ArisSiew: There are those who talk well but seldom do. And there are those who can't speak well, but quietly, do. @ArisSiew Be FEARLESS in chaos. Cancel fear with faith and you can change your life. @ArisSiew. Face your deepest and ugliest fears if you want to fulfil your destiny. @ArisSiew. When fear tries to push you back, PUSHBACK YOUR FEARS with greater determination. @ArisSiew. Fear draws a line, stares you in the eye and dares you to cross it. You either stop, turn around OR shout 'In Christ I can' and cross it. @ArisSiew. In Christ I can do the things that I and others say I can't.